Another in the long line of teen books I’ve been reading. Plot: Juwita is smart and beautiful, but she faces a major obstacle to success: she has no money. Guys keep falling for her, though, and is it her fault if they want to give her cash? She gets through medical school pretty much by taking donations from men. Now she’s graduating and ready to start her own life. Whom among her benefactors will she choose to start it with? The book walks an interesting and rather brave moral line, however. 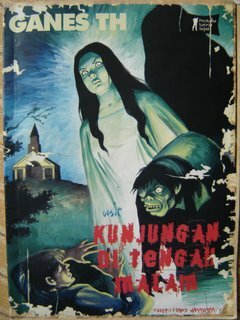 Juwita faces danger a couple of times in her interactions with men. But she’s never really punished, and the book doesn’t seem to take a disapproving tone toward her. She knows her own worth and doesn’t angle for cash; she always waits for the man to offer. In the end she marries the one guy who hasn’t tried to purchase her affections. So she emerges ‘clean’ in spite of it all. To me, this seems similar to the way people tolerate noodle vendors pushing carts down the middle of the highway or hawkers selling newspapers at stoplights. Poor people do whatever they can to survive, and Indonesians generally seem pretty willing to let them do it. Our heroine is a high school girl named Eva. Her hunky cousin, Viggo, has lived with her family since his mom died in a car accident. Eva is cute and a little dim. She’s constantly engaged in a not-so-witty battle of wits with her enemy, Meri, who has hated her ever since they fought over a swing in elementary school. Eva finds her cousin’s diary and can’t resist peeking. In it he reveals that he’s gay. Obviously this is sensitive information which, if it got out, would have an enormous impact on his life. So what does Eva do? She doodles a picture of her cousin hugging another man and writes his name and the word “gay” on it. Then she leaves it at school where, of course, Meri finds it. Meri comes up with this great idea to blackmail Eva into setting her up with Viggo. All Viggo needs is a woman to “turn him straight,” and Meri’s sure she can do it. Many hijinks ensue, including a date to Pizza Hut. It all comes down to a final confrontation before the high school dance, where we discover that (spoiler alert here) … Viggo is not gay. Nope, he’s not gay. He’s gotten a role as a gay kid in a movie, and he’s keeping a fake diary to try and understand what his character is going through. Yeah, I know. It’s the worst surprise ending since Who Shot JR turned out to be a dream. It robs the characters of any chance for real development. I wonder why the author made that choice. Was she afraid the book would get too heavy if he really was gay? Was she worried about a backlash? Most of the cultural oppression going on here at the moment is aimed at women, but gays have come in for their share too. Nobody likes to wake up and find a bunch of fundamentalist yahoos staging a demo around their mailbox. 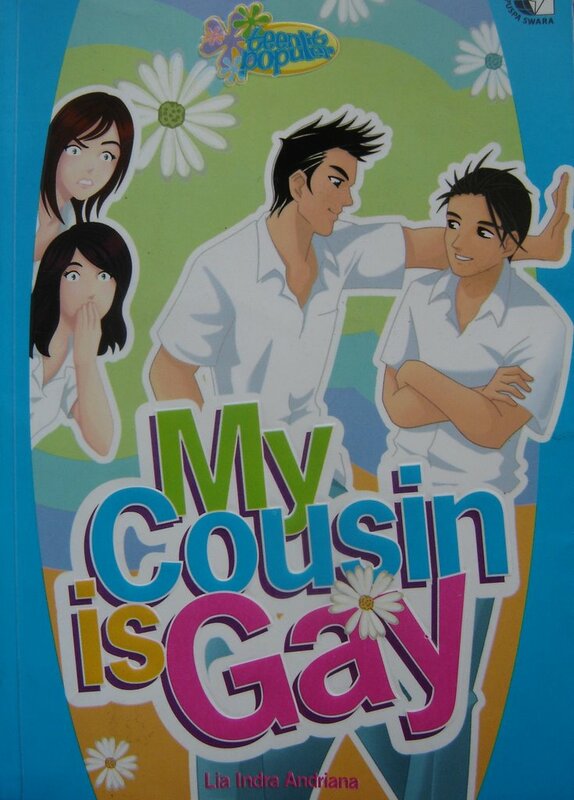 Still, I hope if a gay kid somewhere in Indonesia is looking for support and inspiration, s/he finds a book that offers a little more. I believe to understand another culture, you must familiarize yourself with its literature. I’m not quite up to reading Pramoedya Ananta Toer in the original yet, so I’ve been immersing myself in the works of Ganes TH, one of Indonesia’s most renowned comic-book authors. Ganes doesn’t shy away from hyperbole (“a tale fully flowing with tears and blood!”). He likes a good plot twist. When you have to look up every second word in the dictionary, you need frequent rewards, and Ganes is rich in rewards. Interestingly, A Visit in the Middle of the Night (above) is Christian: a handsome guy decides to kill his sickly wife so he can marry her pretty friend but (gasp!) She’s Not Really Dead!!! and she develops the inconvenient habit of turning up at midnight wearing flowing white robes. But the evil husband gets saved by the local church and turns into a nice guy, and everyone lives happily ever after. 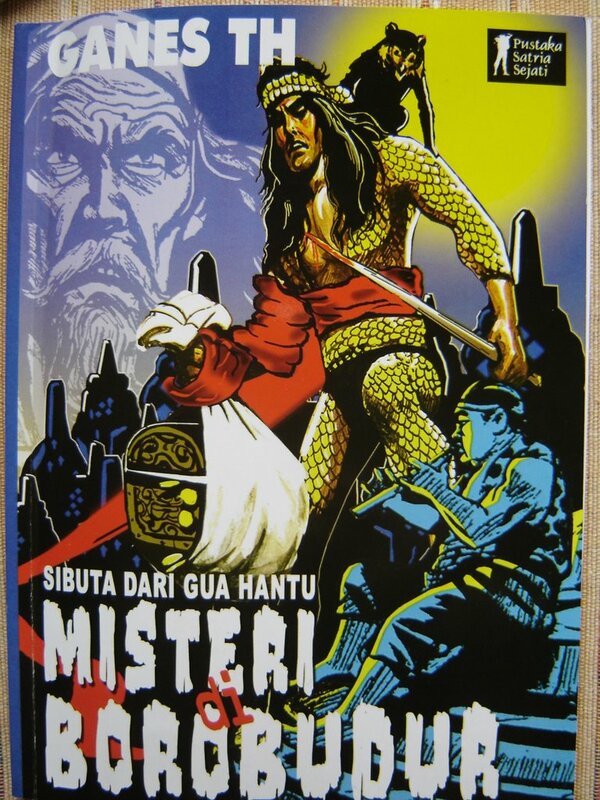 Ganes’s most famous character is Si Buta dari Gua Hantu, the hero of Mystery at Borobudur. Si Buta appears to be Muslim, and he’s blind; his name means the Blind One from Bat Cave. 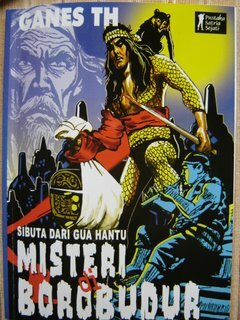 I’m only partway through Mystery at Borobudur, so I can’t tell you much, but it involves a sweet girl, two evil brothers, a secret treasure, and the last wish of a dying man. Furthermore, it’s set on and around Mt. Merapi (“terrifying Mt. Merapi! !”), which erupts halfway through the book, so it promises to be a humdinger. According to one website, Ganes had a drama of his own. After art school, he developed some vague association with the Communist Party. Then, during the anti-Communist massacre of the mid-60s – a mass bloodletting that has largely been forgotten, and has never been properly investigated – he decided to give up “art” and focus solely on comic books, since artists with lefty associations often wound up in prison or worse. I won’t speculate on what it means to be a stifled artist who draws a blind hero, but clearly Ganes’ experience of evil and fear was not entirely imaginary. Kopi Susu 2 Blog at WordPress.com.